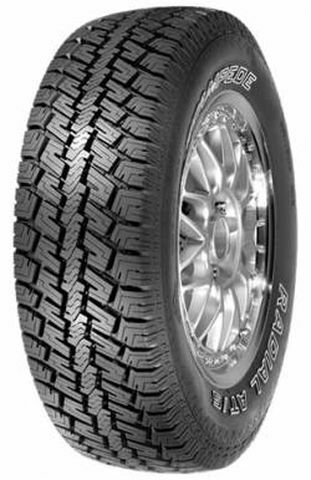 265/75R -16 460AB 2,601 lbs 44 psi 11/32nds 8" 11" N/A 31"
Purchase includes the Sigma Stampede Radial AT/S tire only. The wheel rim shown in the picture is not included. Picture provided is a stock picture from the manufacturer and may or may not reflect the actual product being ordered. All Sigma Stampede Radial AT/S tires are continuously developing with manufactured improvements. With that said, Simple Tire and the manufacturers have the right to change these tire specifications at any time without notice or obligation. Please Note: Specifications of the Sigma Stampede Radial AT/S tires shown above are listed to be as accurate as possible based on the information provided to us by Sigma tires. This product is covered by a 40,000 mile manufacturer’s treadlife warranty. WOW!!! Tires arrived earlier than stated! Actually super fast! I Love the way my 2006 Dodge Dakota SLT Quad Cab V8 rides on & off road with these tires! Improved gas mileage, quiet & very smooth ride. I would purchase this brand of tires again! I haven't had an opportunity to evaluate tread life because tires still look as new as they did when they arrived. Purchased Stampede tires for my truck, arrived 2 days after purchase, really amazed with them, & their performance on trip. Great thread & out performs my last very expensive set of tires. Will purchase again in future. My son is looking forward to purchasing a set for his suv.